This past week I have been busy with non-quilting activities, but I still managed to find the time to work away on the last corner block in the border of Sue Garman’s “Friends of Baltimore”. And, as usual, I started with the vase. This just might be my favourite vase! Slowly, I filled the vase….first with some stems and leaves. You can see that some of the leaves and flowers cover the seam line and flow from the block onto the border. So now I have prepped as far as I can. I am going to stitch everything…well, maybe not everything!… in place this afternoon at my Sunday Afternoon Applique Group. Once all of the stitching is done, I will attach this border to the rest of the quilt, and then fill in the missing pieces. I am linking up to Slow Stitching Sunday. 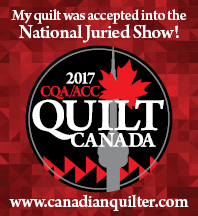 Check it out and see what some fine quilters are up to today! My hexies are taking on a life of their own. I am not exactly sure where this quilt is heading. I am just making it up as I go! Have you tried Inklingo yet? All of these hexies were made using Inklingo. Inklingo is fast, efficient, super-simple and extremely addictive! Betcha can’t make just one!! And, finally, a couple of people asked me if I would show the back of my hexie stitching once it has been pressed. It’s all about spiralling the seams! Our Sunday Afternoon Applique Group met yesterday and wait til you see the Show and Tell! This is Christie’s version of Aunt Millie’s Garden. Spectacular! This materpiece was machine quilted by Carl of Lilac Lanes in Alliston. This is the fourth (!) Aunt Millie’s Garden to come out of this group…and we are patiently waithing for one more…stitch, Kathy, stitch!! Next, we have Lynn’s “Woodland Creatures” a quilt designed by Rosemary Makhan, who sadly passed away recently. The more we looked at the quilt, the more detail we found! This masterpiece was machine quilted by Ruth at Stitching Impressions. I spent most of Saturday working on my border of Sue Garman’s “Friends of Baltimore”. Before I know it I will be finished!! My Sunday Afternoon Applique Group met yesterday and we were (once again!) delighted with some pretty awesome Show and Tell! First, Kathy (with a K) showed her Kim McLean quilt that she started two years ago. Kathy chose to use solids for her backgrounds and a variety of black and whites for the appliques. Kathy brings new meaning to the word “creative”. So impressive! Check out the sashing Kathy chose. It has colorful pins on a black background! This is Helene’s version of Jo Morton’s “Prairie Flowers Encore”. Stunning! Last Sunday, our Sunday Afternoon Applique Group met (and once again!) Lynn dazzled and inspired us with her Aunt Millie’s Garden. Ruth Quinn from Stitching Impressions did an awesome job of machine quilting this masterpiece. You can see more of Lynn’s quilt here. Take a look! I have been hand-quilting “Circle of Tulips” in my frame and beginning to get the hang of it. I am using two different stencils for the wreaths. ..and the larger stencil where the secondary design magically appears. Don’t know if you noticed, but I tilted the larger stencil on a 45 degree angle. I did this so I would not have to stitch parallel to the seam lines. So far I am liking it! This is the stencil I have chosen for the outer border. I have my heart set on this quilt having a scalloped border. I may have to do a little bit of math to get the stencil to work out. I will worry about that when the time comes! I love when stuff like this happens. Makes me feel really humble! I was stitching along and noticed the bias strip look a little….well…..weird. I glued it in the right place, just upside down! Oops! Once I stopped giggling, I took it off…..
flipped it over….and now we are good!! I have started working away on the border of Civil War Bride. First I made the bias stems and glued them in place. I had so much fun making fussy-cut butterflies for the blocks, I decided to continue on the borders. Would you think this fabric would make a pretty cool butterfly? Check out the butterfly on the left! Next, I added a pretty blue bird and a purple posy. It’s a good start! Some of you have contacted me asking about the pattern for the tulip quilt in my last blog post. The pattern is from an old “Quilter’s Newsletter Magazine”. There is a pattern for the block on my website that you can download. The best part is, it is a free download! Here is what you do…click on the button in the top right hand corner of my blog that says “Check out my new website.” Then, click on On-Line Store. Then, click on Part 1 and Part 2 of Circle of Tulips. Easy peasy! While you are there, you can also check out the first of my Hand- Applique Tutorials.